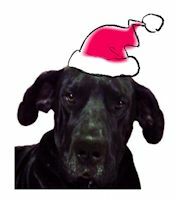 We are writing to you again this year in hopes that your elves were able to make lots of toys and Mrs. Claus baked lots of treats so there will be lots left over for homeless dogs like us. Grandma and the volunteers are always telling us what good dogs we are, and we are grateful for your generosity every Christmas! The toys you brought us last Christmas are well loved and well worn. And what dog wouldn’t want an extra treat or 2 during the day? Treats are also good for training and help us pay attention. We know you have a generous heart, Santa, so our paws are crossed, and we are hoping that we will find some of the entries on our wish lists Christmas morning. Santa, you know that our first wish is always to find forever homes, especially for the senior dogs among us who are often overlooked. But in addition to being very good dogs, we are also smart and know that all of us will not find a forever home this year. So, being realistic as well as very good dogs, we would like toys that can last us a few weeks and not cause Grandma to worry about us eating them and causing a blockage. As you know, Santa, from bringing us size appropriate toys in the past, we are very big and strong chewers. And toys are cheaper than surgery! You also know, Santa, we are orphans, and we will be thankful for anything you bring us. As Grandma tells us, it is not polite to beg or be greedy. We have heard volunteers talking about sending money or gift cards to their grandchildren because they are not sure what to buy them and we have learned to shop on the internet, so if it’s easier …we love to shop on the internet!! Thank you very much, Santa, for reading our letter again this year. We sure hope you can bring us each a toy for Christmas. Of course, two would be great, but one each for all the adoptable and sanctuary dogs at HHGDR would be fantastic and give us all joy this holiday season. And we promise to have Grandma and the volunteers scoop our play yard, so you won’t get your shoes dirty when you step out of your sleigh. PS Santa, please don't bother wrapping our gifts, that is more work for your elves and Grandma. After all, we care about our planet and the global warming we keep hearing about.